My name is Tony Stevens and I have been enthusiastic about producing my very own Herb Garden for some time now. I made a big mistake when I first started my very own herb garden. I jumped in feet first without out any real research or deciding what I wanted from my herb garden. What type of herbs to grow, soil type to use, lighting, indoor or outdoor garden? So what I have created is Gardening With Herbs. It is full of helpful information about getting started with your very own herb garden and have healthy thriving plants growing in just a couple of weeks. Why have I created gardening with herbs you might ask. To help you and fellow gardeners not to make the same mistakes that I did. Have the correct information so you can get your first herb garden up and running with out the frustration and heartache. So I would like to share this knowledge with you, through this site Gardening With Herbs. With the medical Science showing certain limitations and allopathic medicines showing side effects, many people are now looking at gardening with herbs as they are already available in nature to help in not only maintaining good physical and mental well-being, but also healing some of the diseases. Researchers have also figured out a variety of herbs, which taken in their fresh or dried form can not only improve the taste of the food or beverages like tea or coffee, but also cure many medical conditions. On a general scale, gardening with herbs can be classified into culinary herbs, aromatic herbs, ornamental herbs and medicinal herbs. However, since many of the herbal plants possess multiple characteristics, they can be categorized into one or more of these classifications. Culinary Herbs – These are the most widely used herbs in normal cooking and they add a flavour and to an extent aroma to the food. They are also known for their aromatic foliage and the beauty of the flowers that bloom on the plant. Whether thet are fresh or dried, they can still be used for many things. While they may be annual, biennial or perennial, these herbs have tender roots or ripe seeds. Typical examples of these herbs include mint, cumin, parsley and many more. Aromatic herbs – While these herbs have a major overlap with the culinary herbs in terms of adding aroma, these are also very useful in making perfumes or incense sticks. They can even be used for potpourri. Typical examples of these herbs include marjoram, lovage, rosemary, lavendar and basil. Ornamental herbs – These plants are decorative owing to their beautiful shapes and leaf structures and can be used as excellent balcony plants. Not only do they beautify the area, but also some of these have excellent medical properties and this adds additional value. Valerian, Borage, Chicory, mint lavender and thyme are some of the many ornamental herbs that also provide ornamental benefits (easy on the eye). Medicinal Herbs – This final category sums up all the herbal plants that have been used since time immemorial by ancient Indians in form of Ayurveda and the Chinese for their herbal treatments. Marshmallow, turmeric and many such herbs are some of the commonly used herbs for their medicinal properties. Another excellent benefit for gardening with herbs is to control pests in your garden. Some herbs can actually keep these little bugs away and make your gardening experinece a whole lot easier. While most of these drugs are available in the market, getting some of these herbs in their freshest form is difficult. Moreover, with the advances in agriculture, it is now possible to grow a variety of these herbal plants in the gardens of one’s home. I did not know most of this but there are many guides and references, in both online and offline forms that provide information about the various herbal plants, their medicinal properties and how to grow them. You can specialize an herb garden specifically to one of these purposes or a mixture of purposes. You can also grow herbs in a garden with other species and you can even grow them indoors by growing herbs in pots. You don’t need all that much space to grow an herb garden. A four by six foot small plot is large enough to support a small family of plants. A sunny location or shade depending on the plant. Heavy or compacted soil is not ideal for gardening with herbs. If you find that your soil is like this, you can add some organic matter to it. You can use fertilizer but it is not necessary. Unlike other plants, not many diseases or insects attack herbs so pesticides will not be necessary either. There are a few herbs that have some special considerations. Dill, caraway, anise and fennel can become victim to red spider mites in dry, hot weather. Mint is negatively affected by rust. There are two ways to gardening with herbs. You can buy the herb plants and plant them in a garden at home. Herbs can be grown straight from seeds. All herbs can be grown from seed and for the avid gardener, watching a plant grow right from the seed is a joyous occasion because you are able to watch that seed every step of the way from birth to death. 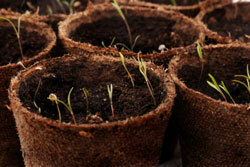 Late winter is the best time to place the seeds in a shallow pot or box. Seeds will grow best in a light and well-drained soil but make sure not to cover the seeds too much. Herbs should be planted shallow especially if it is a fine seed. In the spring, seedlings can be transported outdoors but some herbs, such as dill, fennel, anise and coriander doesn’t transfer well and should be planted directly in the garden. Please feel free to browse the site for more information on gardening with herbs, you can check out all the other articles, which cover various topics from growing rosemary herb, to growing herbs in hanging baskets, or better still sign up to my free gardeniing with herbs mini course. Medical benefits of various herbs to help boost the immune system, fight off colds and flu’s, calm your nerves from the busy life styles we all seem to live. Making sure your herbs see it through to another summer, what you do throughout the growing season plays a vital role. It’s a vital layer of protection for your plants during the long cold winter. Companion plants. Having the correct plants that will grow together and protect each other. To start receiving this amazing information about gardening and plumbing, simply fill out your first name and email address below. We will instantly deliver the gardening with herbs mini course to your inbox right away.